Adolescent border collies are excellent trainers. Blink, my third dog, was the first one to train me to give him water on request. One day as we stood in the kitchen together, he pawed his empty water bowl deliberately. The sound of his nails hitting the ceramic made it go “ding!” Then he looked me right in the eye. I did what any well-trained animal would do: I responded to my cue promptly and I filled his bowl with water. Weeks went by and it happened again in the kitchen. “Ding!” I again filled the water bowl. More time went by and this time I was in the living room, but Blink was in the kitchen. “Ding!” Again, I filled the water bowl. Was I teaching Blink that dinging his bowl meant he was going to get some water, or was he teaching me that my cue to get him water was “Ding”? Yes. By filling his bowl every time, I was positively reinforcing the behavior of Blink dinging the bowl. By wagging his tail, drinking happily, and (to be anthropomorphic) appearing appreciative, he was positively reinforcing my behavior of filling his bowl. I am sure that, just like our dogs, during the early phase of my training I was not yet aware of what I was being trained to do. At some point during my admittedly quick learning process, I became cognizant that I should get water for the dog. Then, at some other point, I recognized clearly that I now had a discriminative stimulus (a cue) that meant one thing and one thing only: get me water now. Along the way Blink made some deliberate decisions. He chose the cue, not me. And he put some reasoning into his choice. He could have chosen to whine, bark, paw at me, etc. But he chose a cue that involved an object (the bowl) where he usually finds water present. His cue is also an auditory cue, a sound that is not an intrinsic or typical noise dogs make (like barking or whining). It required him to use his paw to strike an object in a particular way. Once I was fluent in my water-fetching behavior, Blink shopped the cue around, testing it for stimulus control. He tried the “Ding!” cue on a different person in the household. He transferred it to the water bowl in my office. He even transferred it to a different house, with a different water bowl and a different person. 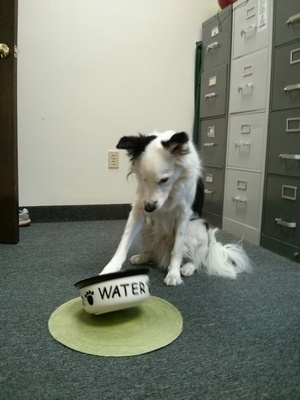 One time when my co-worker was dog-sitting for me, Blink let her know he was out of water by dinging his bowl and waiting. When she also responded promptly to the cue, I’m sure Blink was very pleased with himself and with her! Although I think he’s quite a clever boy, Blink is not an unusually gifted member of his species in figuring out how to train me to get him water. Dogs train humans to do things like that for them all the time: feed me, let me outside, take me on a walk, scratch my belly, pick me up, pet me, throw this for me, and so on. And we train them to do things that benefit us: sit quietly, walk beside me, search out the bad guy or the missing child, retrieve objects, etc. Dog: Licks lips, turns head away, hides behind owner, then finally lunges and barks. Result: Human backs off. The behavior of trying to approach that dog has been positively punished. Human: Pets the dog on the top of the head (pat-pat-pat). Dog: Moves away immediately and goes to lie down. Result: Human learns that dog doesn’t like being petted on the top of the head and stops doing that. The behavior of petting the dog on top of the head has been negatively punished. Human: Sits at the desk, ignoring the dog. Result: Human relents and gives some type of attention to the dog to make the pawing and scratching stop. The behavior of giving attention to the dog has been negatively reinforced. Result: The behavior of smiling at the dog has been positively reinforced. While we humans frequently botch our timing (especially with punishment), dogs’ timing is impeccable—without any formal training! Humans yell at their dogs for shredding the couch pillows hours after the “crime” occurs. The only thing we’re “punishing” is the dog coming to say hello to us after we’ve been gone all day. On the other hand, when dogs deliver a punisher it’s usually a punisher with perfect timing and razor-sharp precision. A well-timed air snap that comes thisclose to your flesh doesn’t injure you in the slightest, but is usually enough to scare you away in one single event. Show me a human who can accomplish that with zero training. You’ve almost certainly heard that “Dogs are always learning.” That’s very true. And I think we can add to that, “Dogs are always teaching.” A good training session is a conversation between trainer and trainee. I think, the more we realize that the role of trainer is fluid and that sometimes we’re the trainee, the better off our relationships with our animals will be.